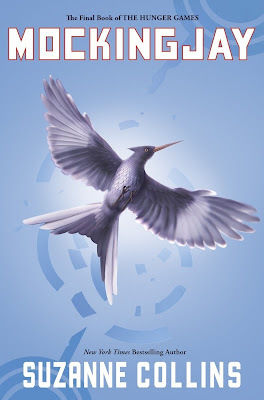 My Thoughts on Mockingjay – Spoilers Abound – my books. my life. Just like everyone else, I’m not doing a real review of Mockingjay. Immediately after I finished, I quickly typed up some notes before my thoughts could get contaminated by my discussions with others. These are those notes cleaned up a little bit. I’m still debating and figuring out some things, but these are my initial thoughts. – As much as I was excited for the book and couldn’t wait to read it it, I didn’t really have many expectations. I was never invested in the Team Gale/Team Peeta debate because I always felt this story was about more than romance. And I think Mockingjay followed that theory. – I loved the first two parts more than the third. I know this is backwards from what everyone else is saying but here is my reason: I thought the third section was rushed. And I think this is essentially what others are saying when they say they wish the third section was more of the novel. The battle in the Capitol was rushed. A lot of the deaths were rushed (more on that later). The ending was rushed. I enjoyed the pace of the first two sections much better. – There was a lot of death and killing in this book. Wow. – I sobbed through the last 10 pages. Like uncontrollably. Especially when that cat came back. I just completely lost it. I felt so heartbroken for Katniss who had just lost her sister, her best friend, and, essentially, her mother. – I was actually ok with the epilogue. This surprised me (the only spoiler I heard was that there was an epilogue that some people didn’t like) because I normally hate them (I pretend the Harry Potter epilogue doesn’t exist). But I thought this one was kind of fitting. Yes, the whole happily-ever-after-and-then-they-had-babies thing is overdone, BUT in this case I think it is a great way to show how the world has changed. Katniss would never have brought kids into the old world. I think the epilogue gives us closure and shows us that the Hunger Games are truly over. – The way things were left between Katniss and Gale makes me sad. I don’t care if she ends up with him or Peeta, but I hate that they aren’t even friends now. I almost feel like that was done as a way to make her choose Peeta. I really dislike that he is who she blames for Prim’s death. – Oh, Prim. It was like Rue all over again. At first, I thought it was a little pointless – the whole thing started because Katniss was trying to protect Prim and then she just dies at the very end? But once I thought about it, I think it’s fitting. The whole thing did start because Katniss was trying to protect Prim, but then it became about so much more than that. Prim’s death doesn’t mean Katniss failed. – Um, what was the point of her fighting to get to Snow and everyone dying along the way just for her to be stopped AT THE MANSION by the rebels who beat her there? That annoyed me. – And Finnick’s death? He deserved more than that. It was so sudden and rushed. If we go back to the Harry Potter comparison (as we inevitably do) I felt the same was as I did at the battle of Hogwarts when we are basically given a list of the dead. People were dying left and right and some of them deserved a few more paragraphs at least. – I’ve seen a lot of people complain about Katniss’ decision to support the final Hunger Games, but I am 100% convinced that Katniss only agreed to them to mislead Coin and distract her from her assassination plan. Katniss knew that those Hunger Games would never be played. – I occasionally felt confused. Like either I was reading too fast or Collins had rushed certain parts. I found myself rereading passages on many occasions to make sense of them. – I am fine with her and Peeta. Personally, I think I would have preferred her not to end up with either of them. I actually thought that’s where the book was heading but instead the Peeta romance was thrown back in there at the very end. It was especially surprising because we didn’t get the real Peeta for the entire novel. Gale seemed much more likely for most of the book, no? – All of this makes it sound like I didn’t like it that much, which is not true. I enjoyed it very much. But it is my least favorite of the three and I wonder if that’s just the way I always feel about the final book in a series. Obviously and author can’t tie up everything the way you’d like. I think it’s impossible not to be disappointed a little. I’d love to hear from you. What did you think? Did you love it? Hate it? Sleep with it under your pillow? Throw it against a wall? Tell me in the comments. I’ve actually heard a lot of people say that they liked the first part more than the last, I feel like the only one saying the opposite. I definitely agree that the end was rushed, but the first 2/3 or so were just so slow that they annoyed me more than the rushed third part. I’m totally with you on the cat thing (the one time I got teary), and the epilogue. You perfectly stated what I liked about the epilogue. I think we’re all saying the same thing. We’d rather have had a better balance throughout the novel. Make the third section a larger part of the book. I love hearing your thoughts here! I agree that the ending felt way too rushed. That’s why I reread the book before posting my huge long spoilery post. I just couldn’t wrap my head around the last third! Then again, I did the same thing with Deathly Hallows, going back and reading everything from when they broke into Gringotts onwards, because it was just too fast. I’ve gone back and started reading the whole series, and knowing what I know now, the parting between Katniss and Gale actually is starting to make more sense to me. Even in the beginning, they were always at odds with each other, even as they worked really well together. I wonder if they were ever really friends, even if they were great partners. I really want to go back and read the whole series but I’m going to wait a little while. When I went back and reread the entire Harry Potter series, I found myself much more satisfied with Deathly Hallows (for a long time I told people I didn’t care for it). I’ll keep my eyes out for signs of Gale/Katniss discord next time, too. It just made me sad because it’s not like Katniss is rolling in friends. I completely agree with both of you in regards to rereading Deathly Hallows! I will be reading the Hunger Games series over as well and will pay attention to Katniss & Gale and their relationship. I was really sad at how that relationship ended but maybe rereading will give me a different perspective. It’s wonderful that you’re ignoring the epilogue of Harry Potter! I too was completely fine with the epilogue in this one, but I wasn’t ever interested in Peeta or Gale. I always wanted to see Katniss do for herself and would have preferred her choosing neither, but it’s not a big deal to me. I was absolutely devastated by Finnick’s death, and I never mentioned in my own post but I really felt angry that they spent so much time and lost so many lives only to stop at the mansion. I thought maybe Katniss and her crew served as a distraction, or used some of the Capitol’s resources, but then there was all this time where they were just hanging out in the clothing shop, then bam, Prim is dead. I thought Prim’s death was somewhat necessary, but not really. What I never understand about things like that is that Coin, if she really wanted Katniss ruined, could have done it in a less transparently evil way – a new Hunger Games, sending Peeta into battle, allowing Prim to go and then get blown to bits. Right. So you can tell I had some problems, but I actually agree with a lot of stuff you wrote, even if I didn’t like this book much at all. Also, the cat part made me sadder than I care to admit. Coin did end up being pretty evil, huh. No different than Snow. I almost thought the book was going to end in an Animal Farm-esque fashion. The new regime being just as bad as the old. Honestly, I don’t remember Coin from the 2nd book (or some of the other characters) so her prevalence in this book took me by surprise. She wasn’t in the 2nd book, none of the officials from 13 really were. I agree with quite a bit of what you say here. I too thought the ending was rushed and there were so many deaths that it was hard to register just who was left living. I think you ended up going back to reread because there were so many things that happened off the pages (one of my complaints). Despite all that, I still recommend the books and I’ll probably revisit this one in audio. I think you may right about that. A lot did happen off the pages. And I’m pretty sure that I lost track of all the deaths at the Capitol. I just waited until she told me who was left. I reread the end last night to think about the criticism I’ve read. I find some of the criticism valid, but apparently it doesn’t really matter to me because I wept just the same. The description of the book really gets me. Also, I love the epilogue. That’s what I thought too, Amy. I’ve been trying to say that her and there, but I don’t think I’ve ever said it as clearly as you just did. I think that’s a fair interpretation. I guess I was using blame a little strongly. I just find it so sad. I love that you loved the book, Amy. I know there’s a lot of criticism out there but who really cares if you really liked it. I am not sure what to think. My feeling is that the entire Gale-blame (or not) situation was created for two reasons: To show how even just causes (the rebellion/war was just) turns people into things they might not have otherwise become, and to allow for Katniss to only have Peeta as an option. But we didn’t need more examples of the first, and the second I just didn’t buy. Even with the little we knew about Gale, I didn’t believe he could be so reckless and black-and-white. He wasn’t that character until it was convenient for him to be. Maybe I should put on a different lens, and see the entire thing as commentary on war/media/etc., but I can’t do it without ignoring the most important things in good storytelling, things that Collins set up for us with the first two novels. She could have sent the same messages she sent in a believable way, without the drugging and the off-stage action, but she chose not to, and, sigh. Pingback: Books: August 2010 [Recap] - my books. my life. I posted my thoughts yesterday. I really hated it. I tried to look at it from a different perspective but even then, I hated it. It was just poorly done all around. I just read your BBAW interview and came over to check out your blog. I just finished Mockingjay and I’m going around seeing what the general opinion of the book is. I’m actually pretty surprised to see how many people were unhappy with it because I was quite satisfied. I agree with you on many of the points that you make here. Especially regarding the ending and the total cop out of having Katniss miss the climax of the book.My biggest concern, going in, was how the Peeta vs Gail situation would be resolved. I was sure the author was going to settle it by killing one of them off and was glad that she didn’t do so. I actually felt that each of the characters was developed to the point where what happened at the end felt natural. Peeta and Gale were able to relate to each other in a way that Gale never will and his fiery personality would always be at odds with Katniss. I like to think though that eventually the two of them do reconnect and Gale finds the right woman for him. It’s funny that you mention the Harry Potter epilogue because I recently mentioned in one of my posts how I never read the last Harry Potter because I heard that he grows up in the end and I hate when books do that. Someone then responded that, that happens in the epilogue, which I could just skip. Perhaps I’ll read the book after all then. I agree with you about enjoying the first two thirds more than the last one, it did seem rushed. Especially Finnick’s death. I’m not really sure how I feel about the ending, I didn’t dislike it, but I didn’t love it either. Probably more because as you said it was rushed rather than any particular plot points. I cried when the cat came back too. I think Peta was taken out of it a bit so that we could see a bit more of Gale before the Peta/Gale thing was resolved. I thought Gale had hardened a bit in this novel, the struggle against The Capitol seems to have changed him or exacerbated traits that were already there. I think not having Peta around made this more evident. I did really enjoy it, but I think I enjoyed the first book the most. I also didn’t really get into a debate about whether Katniss loved Peeta or Gale more–I agree, the story was about more than that. I agree, the last part was rushed and some characters did not get an ending they deserved. I thought it was so horrible that Prim died–her living was what started all of the drama since Katniss couldn’t let her go to the Hunger Games. I also liked the epilogue (thanks for recommending I read it 🙂 ) because, although sort of cheesy/predictable, it did give a nice closure to the story. All the rebels making it to the mansion before Katniss got there also upset me a little. What was the point? Katniss’s vote for the Hunger Games surprised me. But I have to disagree with you on why she voted that way. I sort of get the impression that Katniss hadn’t made up her mind to kill Coin that early. But, then again, that is one of the only reasons I can think she would vote that way. I’m not sure on that point. I was also confused at some points. Katniss’s rationalizing was a little crazy to follow. I also don’t like that Katniss and Gale aren’t even friends. I don’t think they don’t want to be friends, but the distance just makes it easier for them. And I also felt that maybe, if they hadn’t been separated at the end, she could’ve easily chose Gale over Peeta. The separation just made her decision for her, maybe? And I agree that it was my least favorite of the trilogy. But, like you, I could see that being because it was the last book and it’s hard to love a last book. Honestly speaking, the one thing that pissed me majorly was the fact that Gale is shunned completely. I do not think he anticipated Prim to be in the place of the bombing. I think Suzanne made that an easy way for the protagonist to choose a guy and ultimately give an expected ending. Yes, the ending was too expected. Like all chick flicks and so on, the girl picks the more artsy and sensitive guy. A guy who’s more sweet. Reality check- there is no proof one will do that. Why couldn’t she have been a polygamist? I mean yes that would juat spoil it but at least its something different. Maybe not as drastic as that but rather something unexpected. Otherwise I think the book lived up to its expectation with few holes gaping here and there. But frankly speaking, Katniss is rather insensitive to people. Yes I know people are not perfect and Mary Sue like but seeing that she was quite emotional, I think making her chose so late between two perfect like men was somewhat silly. But the book was simply stunning.